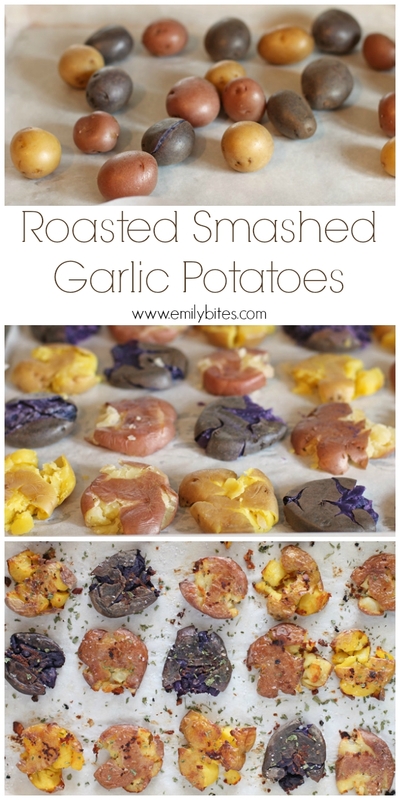 These rustic Roasted Smashed Garlic Potatoes are the perfect side dish. They pair well with almost any main course, they’re full of flavor, they’re crispy on the edges with a perfect pillowy texture throughout and they’re just 120 calories or 4 Weight Watchers SmartPoints per serving! They’ll be right at home on your weeknight dinner table, they’re fancy enough to serve for company, and they’d even be a great addition to a holiday spread (think Thanksgiving or Christmas). You’re going to want to serve them with everything! Looking for more lightened up, tasty side dishes to complement your mains? Check out the side dish section of my recipe index for my Cheesy Broccoli Bake, Garlic Roasted Green Beans with Almonds, Loaded Cauliflower Bake, Zucchini Casserole, Garlic Thyme Roasted Carrots, Cheesy Potluck Potatoes, Spinach and Parmesan Orzo, Parmesan Roasted Sweet Potatoes and many more! Preheat the oven to 450 degrees. Line a large baking sheet with parchment paper and set aside. Drizzle the smashed potatoes evenly with a tablespoon of the olive oil. Sprinkle or grind the salt over the potatoes. Flip the potatoes other and drizzle evenly with the remaining tablespoon of olive oil. Sprinkle or grind additional salt over the potatoes. 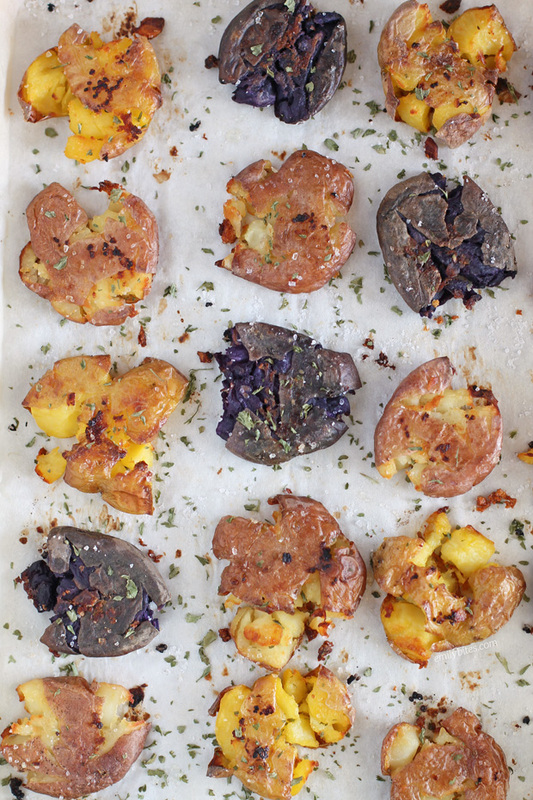 Place the baking sheet in the oven for 15 minutes until the potatoes are getting golden on the bottom. Flip the potatoes over, sprinkle with the minced garlic and place them back in the oven for another 15-20 minutes. Remove from oven and sprinkle with parsley. *My 1 ½ pounds of potatoes worked out to be 24 small potatoes, so I just made the servings 4 potatoes each. You may have to adjust based on the size/quantity of your potatoes. Yum! These look delicious, Emily! I made something similar the other night and I’m definitely going to try your version 🙂 Plus, that potato medley looks awesome! 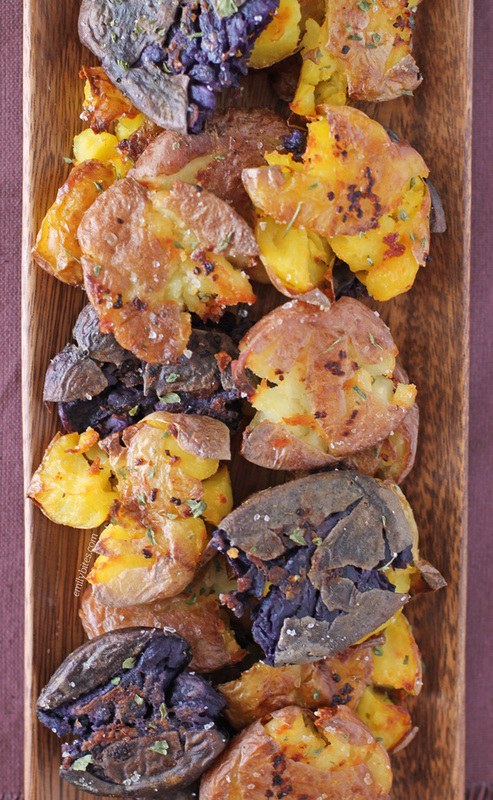 These look so yummy – a twist on a standard roasted potato. Plus more service area to soak up the seasonings.